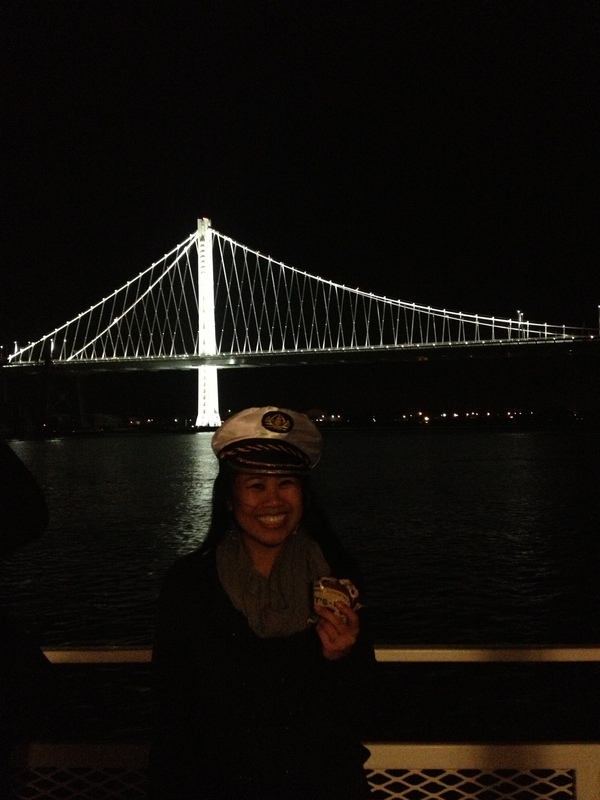 A perk for being an avid Yelper: mid-week night boat ride! 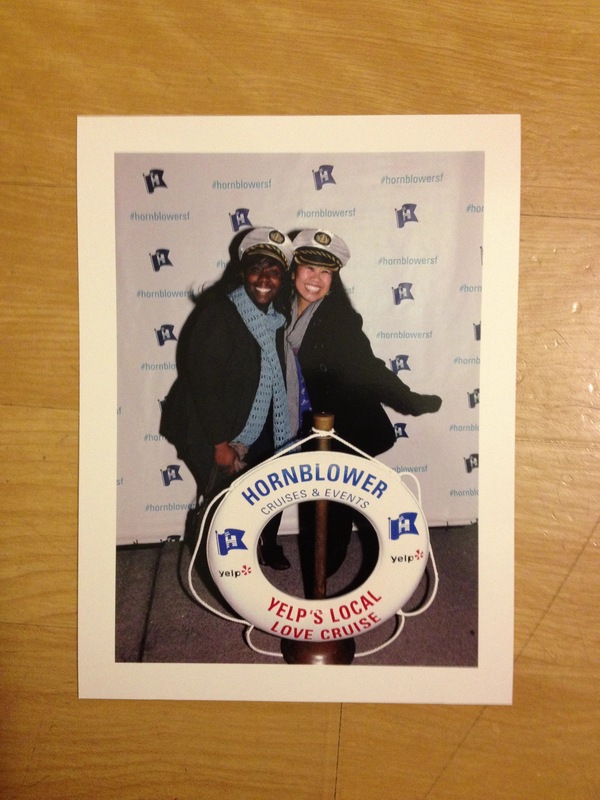 I grabbed a friend and we set sail for a three hour tour (a three hour tour). But first, we got our picture taken with our fancy new captain hats. We boarded at the Berkeley Marina. 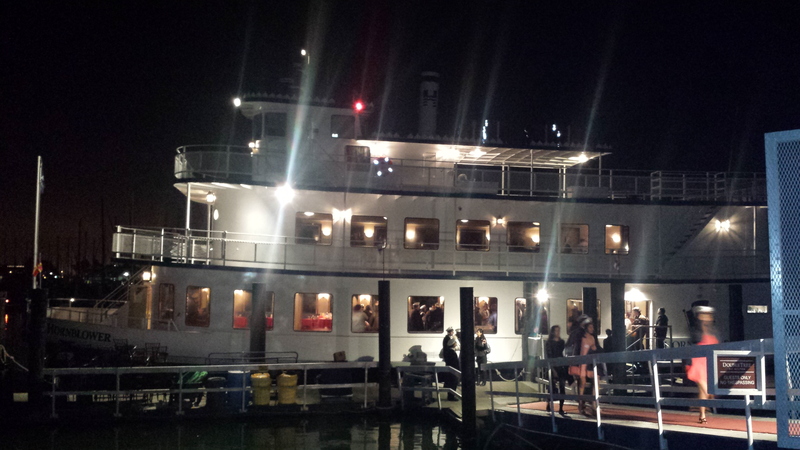 There were about three hundred on the boat this evening, everyone decked out in their cruise best. 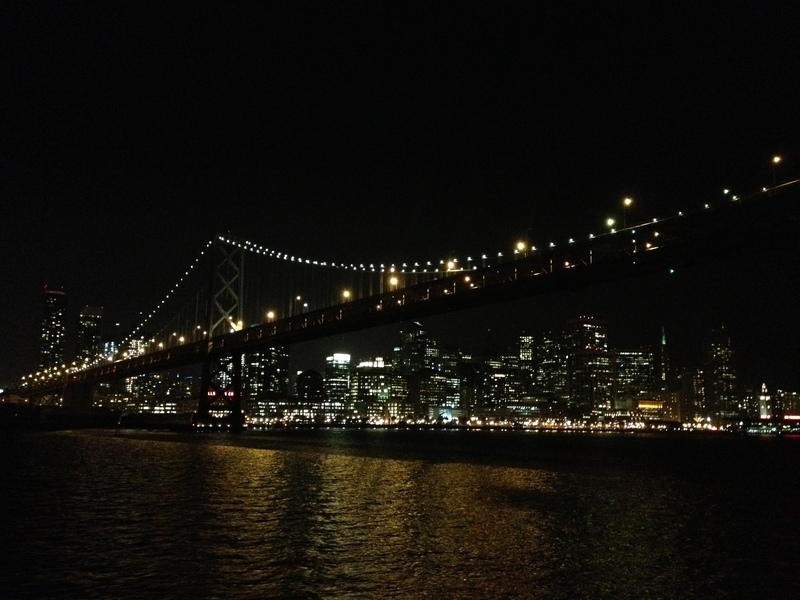 On board there were lots of sweets and savories, libations, and entertainment, but the real treat were the stunning views of the city lights and bridges – views you can only get while in the middle of the bay. I’m on a boat! It’s 52 degrees out with a little wind and I’m eating an It’s-it! But no worries, I’ve got three layers of clothing on, a coat, scarf, boots, and a cool captain’s hat to keep me warm. 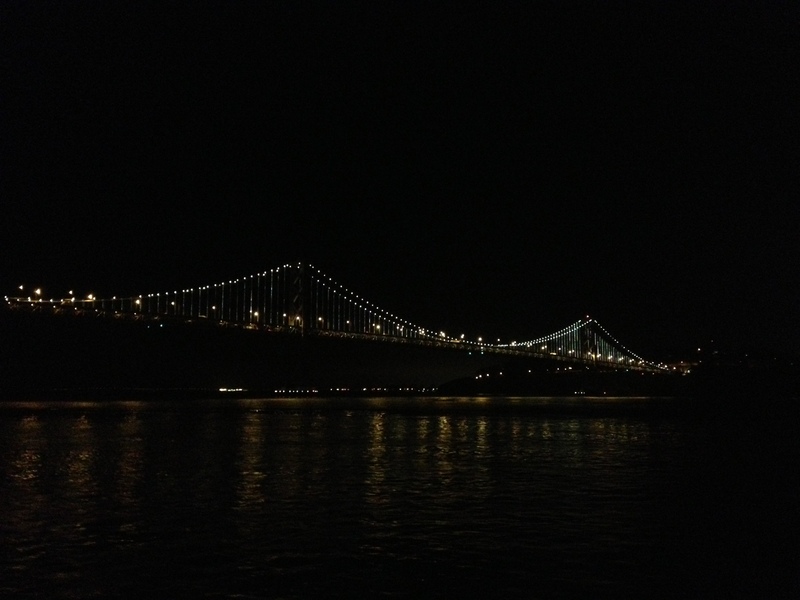 We travelled southbound towards the Bay Bridge. 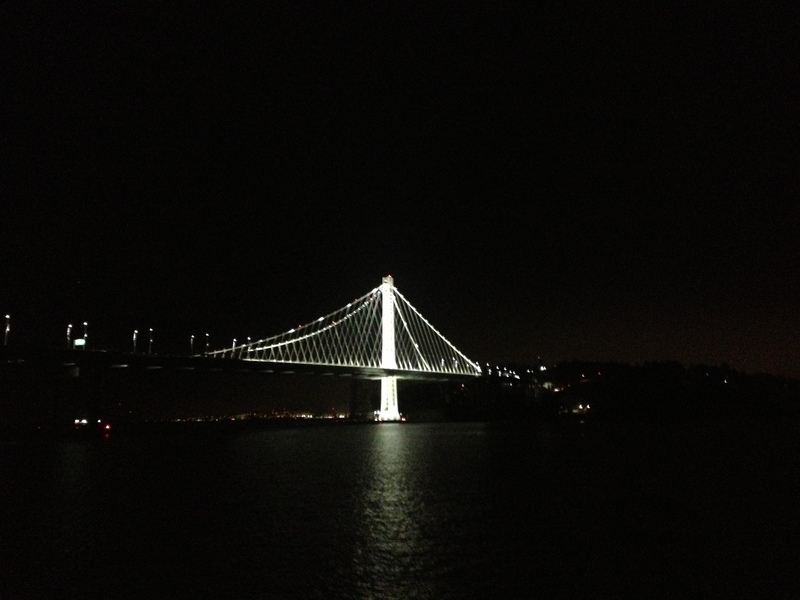 Something about seeing the structure at night and up close is a little magical. After passing under the east side of the bridge, and then the old Bay Bridge, we rode around Treasure Island and began the loop back to the Berkeley Marina. 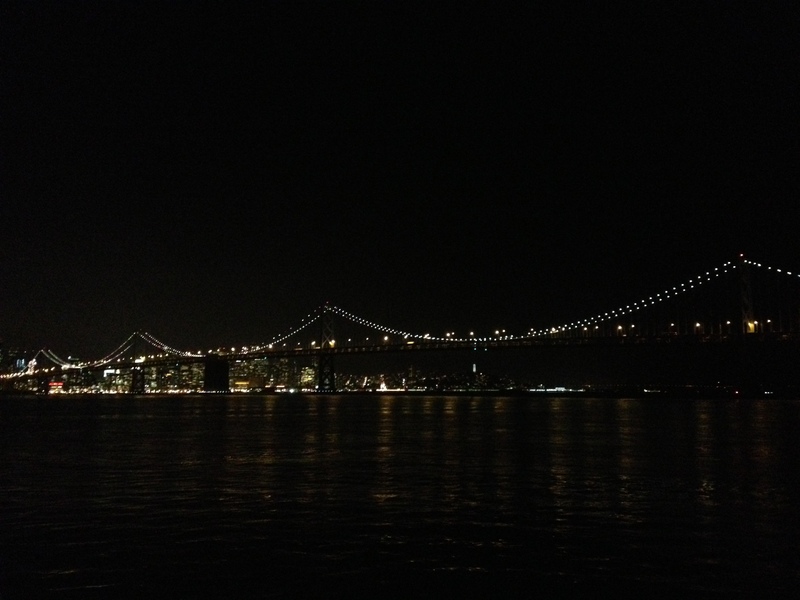 We passed under the west end of the Bay Bridge and were greeted with views of the City and the Bay Lights. I tend to not do well on boats if I have to stay inside, so I spent the entire cruise around the bay on the deck. It wasn’t that windy so the boat only got rocky a couple of times. Plus, the deck had the best views and it was where the live music was playing. Beautiful sites, fresh air and an ukulele-trumpet combo made for a relaxing evening. By the end of the night we were all singing songs together and shaking our huevos (aka egg shakers). Do twinkly lights make you go ‘oooh’? Share your favorite spots to enjoy the sparkly view.